TheArmenianKitchen.com : Kufteh, an Armenian Favorite! There’s been a lot of buzz about kufteh lately on several Armenian cooking Face Book sites. People are asking: What ingredients are used? Which shape is the best – meatball-shape, football-shape or flying saucer-shape? Is it better to bake, fry it, or boil kufteh? Is it best served with or without madzoon (yogurt)? 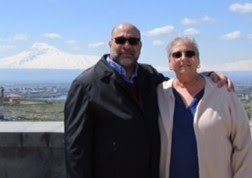 The answers will vary based on the region one’s Armenian ancestors came from. In my family, we have two schools of thought. My mother’s family, from Musa Dagh (Musa Ler), made football shaped kufteh, with extremely thin shells, stuffed to the max with a delicious filling. 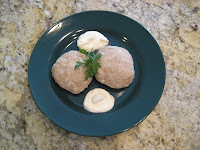 My father’s side of the family, from Dikranagerd, made flying saucer shaped kuftehs – flat on the bottom, rounded on the top, with an equally tasty filling. 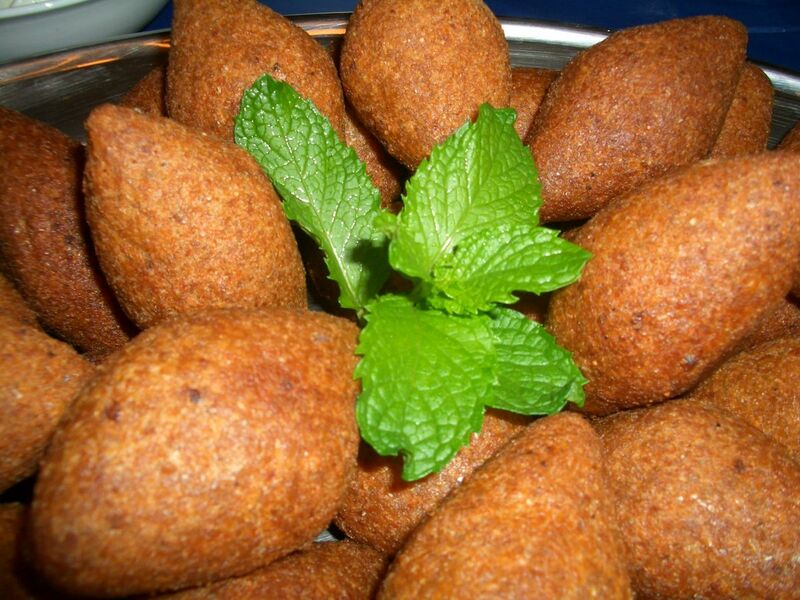 This is a photo of Kibbeh from Wikepedia, but it gives you the idea of the Musa Ler football-shaped Kufteh. Our Musa Ler kuftehs were usually brushed with olive oil and baked which produced a lovely golden color and a little crunch from the shell. The center was moist and flavorful. This was served as an entrée with a dollop of madzoon, and a side salad, or served floating in a madzoon-based soup. Sometimes we just ate them hot-out-of-the oven – without accompaniment! Our Dikranagerdtsi kuftehs were boiled, heaped on a large serving plate and served with madzoon. The exterior was soft and the center oozed a buttery-meaty filling with every bite. We also have a heart-healthy version of the Dikranagerdtsi-style kufteh. Click here for the recipe and video. There’s no getting around the fact that preparing kufteh is very time consuming. If you love this dish, but don’t have the time, or an army of helpers, don’t despair. I will share two other ways to get the kufteh taste without the traditional shape or hard work. Prepare your favorite bulgur pilaf recipe, or, use ours. While it’s cooking make the filling. 1. In a skillet, melt the butter, then add olive oil to heat. Add chopped onions and cook, stirring occasionally, until onions are soft - about 10 to 15 minutes. 2. In a separate skillet, cook the ground meat until it is no longer pink. Drain any excess fat. Season with salt and pepper to taste. 3. Add meat to the skillet with the onions. Stir in the remaining seasonings, parsley, and pine nuts. Cook for another 5 to 10 minutes. To serve: Place bulgur pilaf in the center of the plate (or bowl), top with meechoog, and a dollop of madzoon, if desired. A tomato-cucumber salad makes a perfect accompaniment. 1. Place the bulgur in a large bowl and cover with warm water. 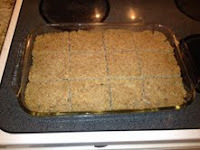 Allow bulgur to absorb the water to soften. Drain excess water, if necessary. 2. Place meat in a large bowl. Add the bulgur and seasonings to the meat, mixing with your hands until well-combined. If the mixture seems a bit dry, add a little warm water, and mix it in with your hands until you reach your desired the consistency. 3. Divide the mixture into two equal parts. Set aside until ready to use. 1. In a large skillet, cook the meat over medium heat until it is no longer pink. Drain any excess fat. Remove meat from pan. 2. Using the same skillet, melt the butter and add the olive oil. Add onions and cook until onions become soft. Add the seasonings, parsley and cooked meat; cook another 2 minutes; remove from heat and allow filling to cool. Adjust seasonings if necessary. Stir in pine nuts. Set filling aside until ready to use. 1. Use a 13”x9” baking pan, or a large (10”) round pan or pie pan. Lightly grease the bottom of the pan. 2. Press one portion of the shell mixture into the bottom of the pan, flattening it evenly to fit the shape of the pan. 3. Evenly spread all of the filling over the bottom layer of the shell mixture. 4. NOTE: Keep a bowl of warm water on hand for this step. Using a large piece of parchment paper or waxed paper, flatten the remaining portion of the shell mixture with your hands or a rolling pin so that it will fit the shape of the pan. Lift the paper with flattened topping and carefully invert it over the filling in the baking pan; gently peel the paper away and lightly press down the top layer. If the top layer cracks or separates, dip your fingers in the bowl of warm water and press the topping back together. Tuck in the edges. 5. Using a knife that’s been dipped in water, score the top layer into squares or diamond- shaped portions. Brush surface with a little olive oil or melted butter. 6. Bake in a preheated 350°F oven for 35-40 minutes, or until top is golden brown. Serve with plain yogurt, and a refreshing chopped salad. Are Kufteh mote like the Levantine Kibbeh than regular meatballs? I love how you've simplified this recipe and will give it a go. Thank you so much! To answer your question: Most Kufteh recipes are like kibbee, but some can be shaped like meatballs with the stuffing inside. No matter the shape, they're all delicious! Happy Armenian Christmas Robyn and Doug. When mom made Kufteh I remember a heavy vinegar smell coming from the kitchen. What was that all about? 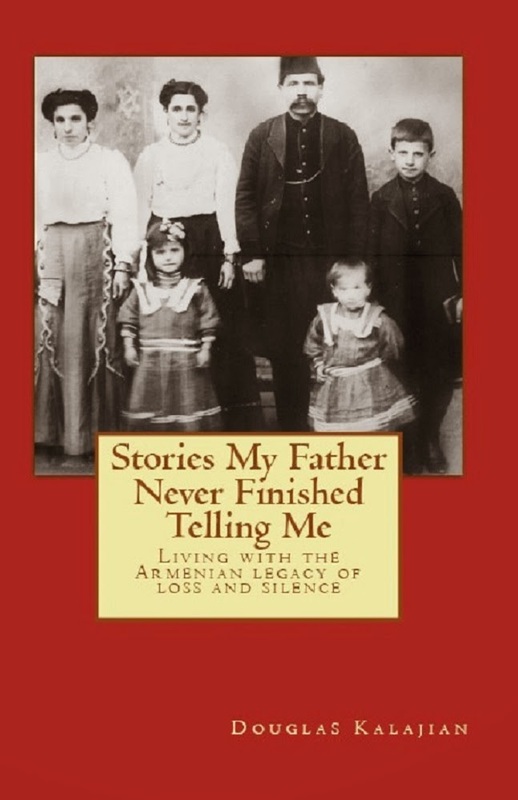 Her dad and in-laws were from Gasma near Divrigi (Sivas). Hmmm, that's a new one on us. Were the kuftehs boiled? If so, maybe, and this is a wild guess, vinegar was added to the boiling water to help the kuftehs keep their shape. Perhaps someone out there has an answer.